In eastern Asia, small weapons were invented in ancient times that were called "Anki (暗器) " that weren’t just limited to ninjas. The definition of Anki was something small enough to be brought with a man for the purpose of self-defence or assassination. Anki were camouflaged to appear like a tool and not a weapon when glanced at. We often find such weapons in Chinese martial arts but there were much more Ankis used by ninjas than those fighters of kung‐fu. Nekode (猫手) was one of them. Nekode was a finger cap made of iron with a weight of about 70g. On the top of the nekode, a sharp nail was attached. In Japanese, " Neko (猫) " means "cat" , "de (手) " means "hand" . The shape of a man's hand wearing a nekode on his fingers looks like a cat’s hand, that’s why it was given the name “nekode”. Before putting on the nekode, the ninja would apply poison on the nail so that when the ninja scratched the enemy, it would be able to kill them even with a small graze. One theory suggests that ninja were able to climb ramparts with these on but in all likelihood this was probably not possible as they would have come off the fingertips easily. 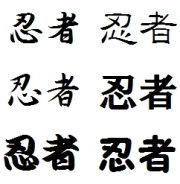 Similar kinds of weapons to nekode that are types of anki include "Kakute","Tekken" , "Tekko-kagi" ,"　Shikomi-tessen (仕込み鉄扇)　" , "　Shikomo-hibashi (仕込み火箸)　" , "Nigiri-teppo" among others. In times gone by, elderly people could use anki as for protection but in modern times, wearing such items on the street would most likely have you arrested. For this reason, anki should now only be enjoyed as a collection item only.